Like most of the rest of you, I vacillate between utter exhibitionism and fetishizing my privacy, between shameless self-promotion and a heartfelt desire to take my blog and my neuroses and crawl under a rock. "Go," I'll prod you, "Look at my new blog." But then, in a fit of embarrassment, I'll add, "only if you want to, of course. When you have time. It's kind of stupid." And I'll feel a twinge of remorse: so exposed. Sure, it's okay if everyone knows that David Sedaris has a compulsive urge to touch complete strangers on the tops of their heads; but he's a public figure. He's a real writer. We know about him; we know about his family; we know about his partner Hugh. In fact, we know them so well that we know that they're all suspicious that any minor interaction with Mr. Sedaris will be reported in print. What will the victims of my foray into new realms of self-publication think? I don't dare ask. I've only told 3 people about my blog so far. Because they all suspect that I won't have taken a sudden interest in current events and citizen journalism, I'm certain they assume I've reverted to deep adolescence. My sister-in-law has already ventured an opinion on the blog: "I thought there'd be more about lunch," she told me. Perhaps there should be. Lunch is an important meal, the meal that offers you the most options. You can just eat a Snickers bar, and that'll work; their advertising even gives you license to do so. You can eat lunch truck food if you're one of those people lucky enough to work at a company where the lunch truck makes its daily rounds, signaled by the melodious tooting of La Cucharacha on the horn. You can go for healthy and drink carrot juice and eat one of those dreadful black bean wraps. My Special K box (the kind with the dried strawberries that I fish out well in advance -- years in advance -- of eating the cereal) tells me I can substitute a bowl of Special K for whatever it is I'd normally eat for lunch and I'll actually lose weight. Or you can go classic and have a turkey sandwich or a burger. Or a BLT if you're Stephen Colbert. You see what I mean by options. Eat a Snickers bar for breakfast and people will accuse you of being well along the road to committing a serious sugar-induced felony; eat Special K for dinner and people will pity you, you poor pathetic thing, eating a bowl of cereal for dinner. Drink carrot juice every day for a snack and not only will people roll their eyes; there's also a good chance your palms will eventually turn orange. Lunch, then, seems worthy of more attention than it gets. That's why I'm proposing to launch a new academic journal with my brother, who also spends quite a bit of time reflecting on the many virtues of the middle meal. I can see it now -- LUNCH: an international journal of the midday meal. It'd look something like this (glossy cover, high impact yellow) and back-breakingly expensive subscriptions would be available in both print and electronic form. There'll be no problem soliciting content. It seems that quite a few people have already invested significantly in documenting their lunches on the Web. Some have aimed for quantity alone. Others have gone the full documentary route, cataloging each lunch and annotating it with high quality metadata. Mike Dust used to have a fabulous website that described his every lunch -- a very complete, well-executed photo journal that my brother and I stumbled on whilst searching for compelling photos of chicken fried steak. For some reason, not long ago, Mr. Dust took down this part of his Web site. He never answered the plea I sent him in a carefully-worded email. So now we'll have to content ourselves with looking at "what mike dust ate for lunch" retrospectively, using the Wayback Machine. I'm hoping he'll restore the original soon. Perhaps he's worried that his Web site will count as prior publication for high quality journals such as Lunch. Not to worry, Mr. Dust; our liberal copyright policies will allow authors to republish their own content on their websites (for a nominal re-publication fee that goes directly in the Editorial Cookie Fund). What would Lunch have in it besides results of field studies of this sort? 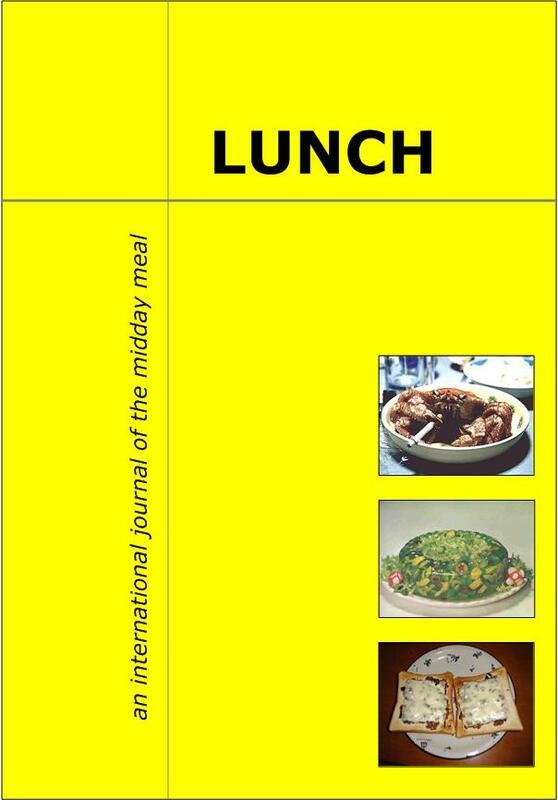 It seems to me that both lunch technologies and lunch dynamics would be fair game for the Journal. 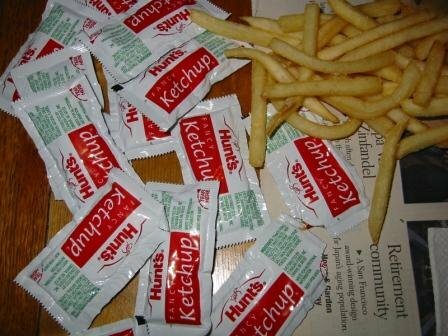 Take, for example, the everyday catsup packet. It's a design that hasn't changed for quite some time. We'd have to ask ourselves why this form has endured (especially in an era of the hybrid spork, advanced butter applicators, and supersized orders of french fries). Why has the application of butter been problematized while the application of catsup has not? Does the catsup packet have enduring cultural importance in its impenetrability and half-teaspoon serving size? Does it remind us of more innocent times when hamburgers were smaller and people were more tenacious seekers of condiments? After conferring with my brother, we decided to do what other journals do to ensure we'll get through times when submissions are thin on the ground: special issues. For example, a special issue on crustaceans would have no shortage of volunteer editors. And apparently libraries currently pay over $700 per year for the Brill publication Crustaceana: The Journal of Crustacean Research; it doesn't even come with garlic butter. We can do better and charge even more. But today, lunch or no lunch, I put a link to my blog on my home page. It felt like a big shameless step forward.